Guppies are ideal for rearing in ornamental fish bowls. You can select a pair or two depending upon the size of the ornamental fish bowl. 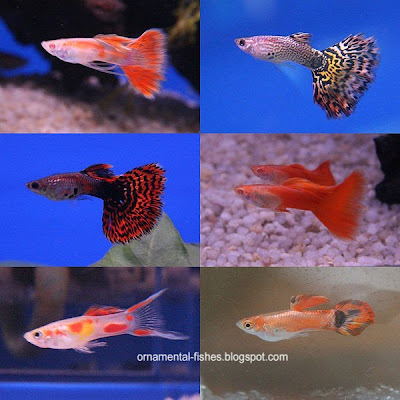 Go in for fancy guppies as they are very colorful with varieties of tail shapes. Try to convince and get at least one female. 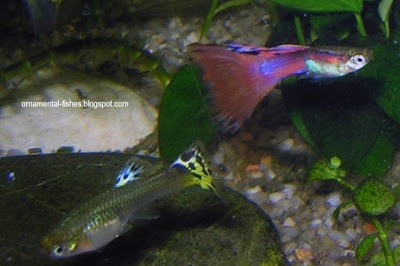 Normally guppy breeders do not sell their female fish, so as to have exclusiveness for their breeds. They show gender dimorphism and the males are very colourful and smaller when compared with females. Guppies mature when about one month old and may start breeding. The guppies are live bearers and female deliver up to 200 babies after a gestation period of about 22 days. The babies are free swimming and fend for themselves right from birth and do not require feed for two days as they will be carrying food reserve in the form of yolk sac. Adults and older siblings may eat the newborn if they are not separated immediately. You do not require to set any filter or aerator in ornamental fish bowl as guppies are smaller fish when compared to goldfish. The passive dissolution of oxygen into bowl water will suffice the oxygen requirement of the guppies. You can feed them with flake or granular feed and female guppies require blood worm feed for maturing and gestating. You can feed the fish twice daily and the feed must not remain after two minutes. Do not over feed the fish and if fed excessively the remnants of feed will decay and cause fungal and bacterial diseases for the fish. Protect the ornamental bowl from sudden temperature fluctuations as fancy guppies are delicate and sensitive. Guppies tolerate salinity (saltiness) and prefer alkaline water. Addition small quantities of calcium carbonate help them to get bright colours. If the fish breed in the bowl , separate the babies and grow them separately. Do not crowd the ornamental fish bowl with parents and babies as this will start a chain of problems for you.